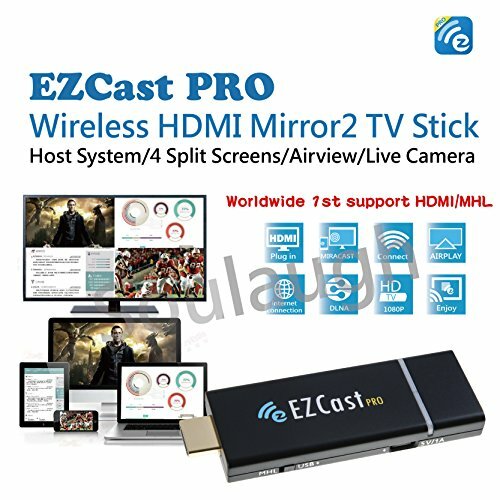 EZCast Pro dongle is a new solution based on the popular EZCast product. Not only supports all EZCast major functions, but also comes with more brand new innovations, such as Host Control, Preferred Device, Split Screen and AirView. It integrates 802.11n 2T2R WiFi transceiver and the latest MHL 2.0 interface inside, which will bring you the best WiFi performance and convenience as well. Get the great device for your educational or conference environment now! 1.Novel hardware design: provides 2x output timing up to 1080p@60p, 2x DDR3 memory size, and 2x WiFi bandwidth (11n, 2T2R). 2.Dual Display Interfaces: The MHL compatible output allows you to connect with MHL2.0 enabled TV/Projector/Monitor without extra power cable. 3.Conference Control: provides conference control panel for more efficient and effective meeting. 4.SW Features: Allows to display content from different sources up to 4 split screens, this is the best way for you compare different content in a meeting or class. 5.Multiple WiFi Display Standards: Support new EZCast Pro app and common WIFi display standards like Miracast, Airplay and DLNA. 6.Regular OTA updates: Through the cloud server, we will regularly update the firmware to improve compatibility, add new features and fix bugs. Soulangh specializes in providing Wireless projector equipment for Conference, WiFi display, and USB display products. We provide the series of EZCast and EZCast PRO. We have a dedicated team for providing professional customer service to customers! ★Content Broadcast(Airview): This new feature brings hardware to broadcast current display to any other connected device.Simply enable this icon,and all you have to do is waiting for content to be displayed.It's a great way to share the presentation details in your meeting. If you have any questions about this product by EZCast、GloryKylin, contact us by completing and submitting the form below. If you are looking for a specif part number, please include it with your message.